If you’re not yet a Bespoke subscriber, you can still get Bespoke’s 2017 Outlook Report with a 30-day free trial to Bespoke’s premium research! Click here to learn more. Eight years ago today, the presidency of what many called the most anti-business and anti-market candidate ever elected to the country’s highest office began. At the time of President Obama’s inauguration, for many, today couldn’t come soon enough. The consensus was that once his four years in office were done (because how could he ever be elected to a second term), the overall sentiment would be “good riddance.” As the saying goes, though, that’s why the play the game, because even when you think you have it all figured out, the outcome often looks different than what many expect. 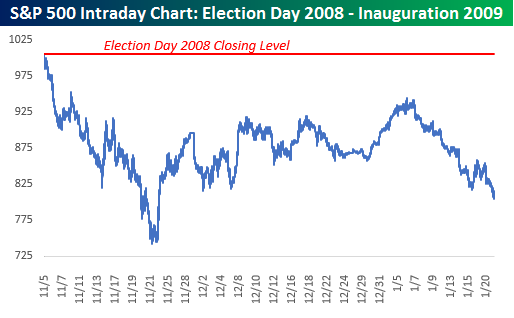 Right out of the gate after the 2008 election, stocks reacted negatively. On the day after Obama’s election in 2008, the S&P 500 declined over 5%, and it kept going down from there. At the intraday low in November, the S&P 500 lost more than a quarter of its value, in what was one of the steepest sell-offs in reaction to a Presidential election in market history. 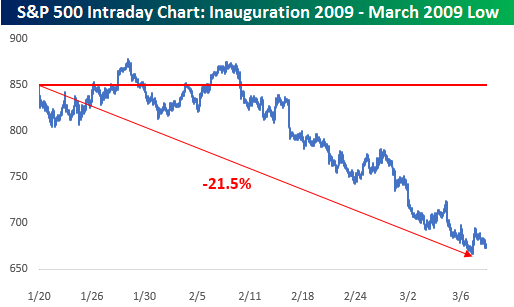 The market recovered a bit from there, but remained extremely volatile throughout the transition, but at the end of the day on his inauguration, the S&P 500 was still down 20% since he was elected. We would be remiss not to mention the fact that the US economy was in the middle of a Financial Crisis during this period so that was a big contributor to the market weakness, but the general perception from the markets was still that Obama would be bad for stocks. If Obama was hoping for a honeymoon once he came into office, he didn’t get it. While the first couple of weeks of his Presidency saw sideways trading, the bottom fell out of the market again in early February, falling over 21% through early March. At this point, investors were wondering how many bottoms there were to fall out of, while President Obama was probably watching the headlines pile up and wondering what he had gotten himself into! If you’d like to see the rest of this week’s Bespoke Report newsletter, take advantage of our one-month Bespoke Premium free trial offer that includes our 2017 Outlook Report. Sign up now at this page.